faUSt are set to tour the UK this November with a series of headline dates which will take them across a number of British cities. Fresh from their headline appearance at The Dome in London's Tufnell Park as part of Raw Power in May, the dates will kick off on November 23 and 24 with a pair of shows at Lewes' Con Club, before they travel to London for a trio of shows at Cafe Oto between November 25 and 27. From there, the band will travel to Scotland for shows at Glasgow's Òran Mór (November 28) and Edinburgh's Summerhall (November 29). The tour wraps up with shows in Manchester at Gorilla (November 30) and at Bristol's Fiddlers Club (December 1). The touring line-up will consist of original members Jean-Hervé Peron and Werner Zappi Diermaier as well as long time faUSt collaborators Geraldine Swayne and Amaury Cambuzat. 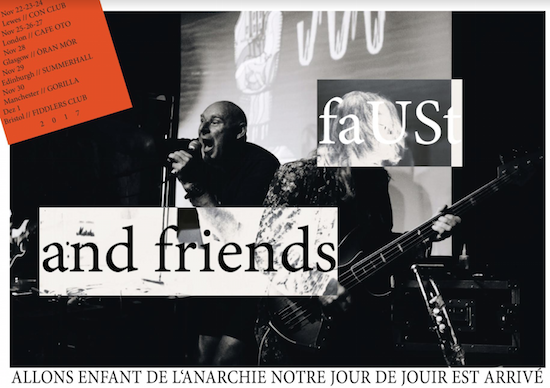 Have a read of our recent chat with faUSt's Jean-Hervé Peron and GNOD's Paddy Shine about the two bands' upcoming live collaboration at Milhões de Festa in Barcelos, Portugal here.